The Blood Collection Monitor, provided by us, is comprehensively in demand as it comes with LCD / VFT display. 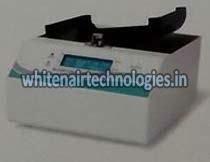 We are one of the prestigious Manufacturers and Suppliers of Blood Collection Monitor in Telangana, India. With us, feel absolutely free to place small as well as bulk orders without giving second thought to it. Our Blood Collection Monitor can be acquired from us at the most competitive prices.